At the end of 1st century Saint Ignatius of Antioch stated: “My spirit bows in adoration to the cross, which is a stumbling-block to those who do not believe, but is to you for salvation and eternal life.” (Letter to the Ephesians, 18). The actual physical cross was a painful reminder of public execution and the instrument of Christ’s death so early Christians didn’t associate it with their faith and victory over death until St. Helena discovered the true cross in the Holy Land in 326-328 A.D. According to the Sacred Tradition of the Orthodox Church the true Cross of Christ was made of three types of wood: cedar, pine, and cypress. The Old Testament verse from the prophet Isaiah brings the Old and the New Testaments together: “The glory of Lebanon shall come unto thee, the fir tree, the pine tree, and the box [cypress] together to beautify the place of my sanctuary, and I will make the place of my feet glorious.” (Isaiah 60:13). The mentioning of “place of my feet” is interpreted as the foot rest on which feet of Jesus were nailed (or suppendaneum). 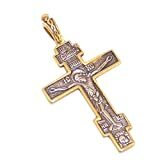 After that Christians accepted the cross as their symbol and tradition of wearing plain wooden or ornate silver and gold crosses under the clothes (close to the body and heart) was adopted and is widely spread in Eastern Orthodox countries, such as Greece, Bulgaria, and Russia. Gold was widely used in Christian art for mosaics and icons symbolizing the radiant light of God, especially on halos, and the splendor of the heavenly kingdom (mostly on the backgrounds) where is no night or darkness. 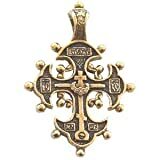 Gold crosses were not wide spread among the population due to high cost and most of the orthodox cross necklaces were made out of wood or silver. There are many different types of crosses and their popularity and history are usually closely connected to the geographical place of origin: Jerusalem Cross, Cross of Cerdanya, Celtic Cross, Armenian Cross, Basque Cross, and many others. We are concentrating on the history and tradition of the Russian Orthodox cross which consists of three horizontal bars crossing the vertical one. In the earlier tradition all bars were parallel and only later, between tenth and eleventh centuries, the bottom bar started to appear slanted thus forming the cross that we know today as traditional Eastern orthodox cross. 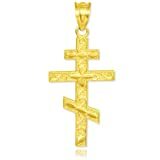 These gold crosses adorn the cupolas of the churches, shining like beacons of divine light, are worn as Orthodox cross necklaces in Russia. Crosses also are placed on the graves of the departed. The top bar is shorter than the second and represents the place for the Pontius Pilate inscription written in Latin, Greek and Hebrew: “Jesus, the Nazorean, King of the Jews.” Instead of the full inscription, it is traditional to see just four letters on the upper bar: INRI which are derived from the Latin: “Iesus Nazarenus Rex Iudaeorum” or sometimes upper bar is left empty. The middle bar, which represents the place were hands of Jesus were nailed usually has four letters “IC XC” which are the first and last letters of each part of the name in Russian transcription for Jesus Christ. Traditionally there is no controversy surrounding the origins of the two upper bars of the cross, while the bottom (slanted) one gives room for different interpretation and conflicting theories. In the early crosses that came from Byzantium the lower bar is not slanted and is perpendicular to the vertical bar, same as the two upper ones. It is representative of the footrest that may or may not be present on the original cross on which Jesus was crucified. The 11th century account states that the slant points to the difference between the thief who repented on the cross and the one who did not, thus representing the balance of good and evil. The good thief who found salvation at the end of his suffering, will ascend to heaven (thus the elevated end of the bar) while the thief who never repented would be send downwards to hell (the down-pointing end of the lower bar). In this interpretation of symbolism of the cross, the salvation and upcoming judgment of the second coming are revealed by the cross at the time of Christ’s crucifixion. Closely related to this interpretation but slightly different is the theory that the right foot of Christ was elevated to lighten the burden of the faithful while he left foot was sending those who have no faith down to hell. This view was widely spread in the written Russian Christian tradition of the sixteenth and seventeenth century. We can only speculate what influenced these later writers to interpret the structure of the Russian Orthodox cross that way and what earlier versions of the same theory did they come across. With many fires destroying ancient books throughout the history, a lot has been lost leaving room for guessing game and speculations. It is also interesting to investigate the origins of the cross with what appears to be a moon crescent on the bottom. Such cross is usually used in architecture crowing the star-adorned blue cupolas of the churches. Traditional explanation describes it as the symbolic sign of victory over Tatar-Mongols that have been plundering Russian soil for centuries, destroying churches and killing peasants. It would be a beautiful legend but such crosses were present before Tatars first set their foot on Russian soil, for example, St. Dimitri cathedral in Vladimir (1194-1197) where it has been proven that the cross presides the invasion. Such crosses are also present in oldest church service books of the XIV century as well as in some stone crosses of ancient churches. Boris Uspensky give the following explanation in his book “The Cross and the Circle: History of Christian symbolism”: “In pagan culture the sun was associated with the cross, that’s why the cross was usually accompanied by the images of the moon (crescent). When Christianity was established, the cross became the symbol of Christ while the crescent – the symbol of The Holy Mother of God, Theotokos. The example of such symbolism can be seen on the old icon of Ostrobramska Mother of God (Our Lady of the Gate of Dawn) from the city gate in Vilnus, Lithuania, dated 1431 or may be even earlier, which is a treasured relic for Orthodox Christians and Catholics alike. The crescent is part of the metal cover (oklad) of the icon and not the painting itself which also represents very rare iconography as Theotokos is depicted by herself, without an infant Jesus. 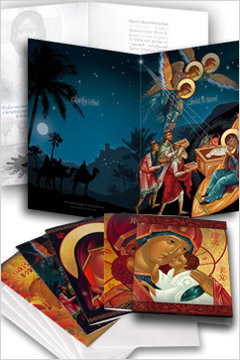 By some accounts, Theotokos standing on the moon signifies the immaculate conception as the crescent is an ancient symbol of virginity. There are two most prominent interpretations in the writings of both ancient and modern theologians about the origins of the “Woman of Apocalypse”: The Mother of God and the Holy Apostolic Church. Both these interpretations fit perfectly in the theory of cross towering over the crescent moon, though such cross is hard to find as an orthodox cross necklace. It is mostly prevalent in the architecture of the churches adorning the cupolas. One more theory regarding the slanted lower bar in the Eastern orthodox cross is worth mentioning as it is related to one of the rarest crosses: St. Andrew cross. St. Andrew, the patron saint of Russia, was a first apostle preaching the Christian faith before and after the death of Christ. Condemned to the painful death by crucifixion in 62 A.D. in Greece, St. Andrew died on X-shaped cross, declaring that he is not worthy to die on the same cross as Christ. The characteristic X-shape may have influenced the slant of the lower bar on the orthodox cross. The Greek monastery of Vatopedi possesses an ancient cross of St. Constantine which belonged, according to the legend, to the founder of the monastery. 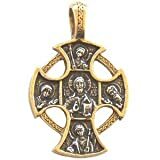 This cross is mentioned in the tenth century as being hidden from Arab invaders and thus pre-dates the adoption of St. Andrew as patron saint of Russia and points to the Greek origins in the slanted bar design of orthodox cross.